Installed Starting at $4.75 per SF! As the original stone coated steel roofing system, the DECRA product line represents a perfect blending of over 40 years of research and practical experience. 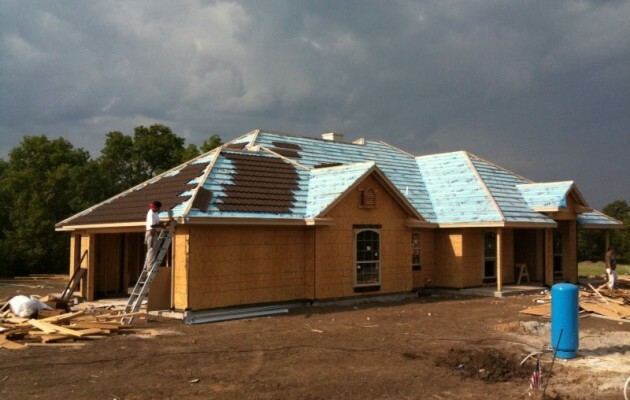 This is a new construction Decra Tile roof job out in Weatherford TX. 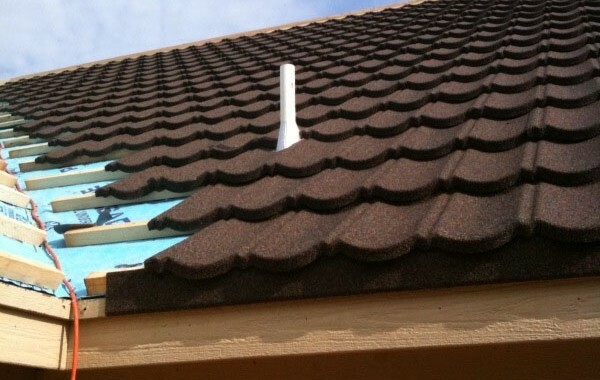 You can see how the Decra Tile is laid on a hip roof. Here is a good picture of the batten system laid out over what looks like a breakfast nook. 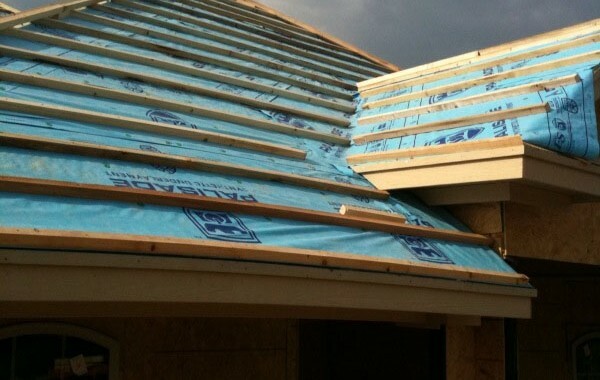 The 2x2's are nailed to the roof and then the Decra Tiles are nailed to the battens. Here you can see the PVC pipe flashed out around the Decra Tile. In this valley there will be a strong metal valley that lays underneath. The Decra Tile will cover the entire metal valley. 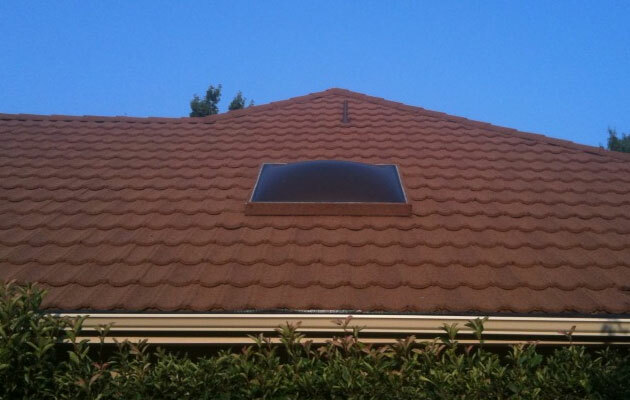 Decra uses a special flashing to help protect chimney's and skylights from leaking. You can see here that the crew is prepping the chimney for flashing. Here's another shot of the roof batten system. It is now ready to nail on the Decra Tile shingles. Decra organic roofing is manufactured using the finest lightweight zinc/aluminum alloy coated steel, covered with 3M ceramic coated stone granules and sealed with our exclusive polymer coating, Decra Roofing Systems are the most beautiful, durable and trouble-free roofs available today. 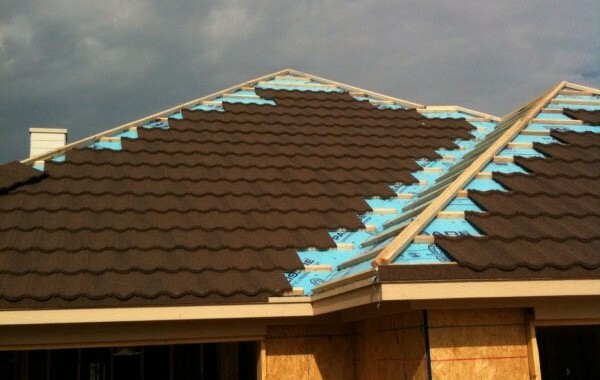 Decra Shake is the ideal roof. Offering the beauty and richness of cedar shake and the protection of stone coated steel. With a color pallet ranging from traditional brown and grey to green and black, Decra Shake will complement any color scheme. And a Decra Shake roof will last a lifetime. Official colors include: Charcoal, Coffee Brown, Shadowood, Granite, Teak, Sea Green and Weathered Timber. 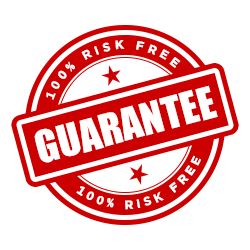 Ask your representative for samples and pricing when you request your quote today. 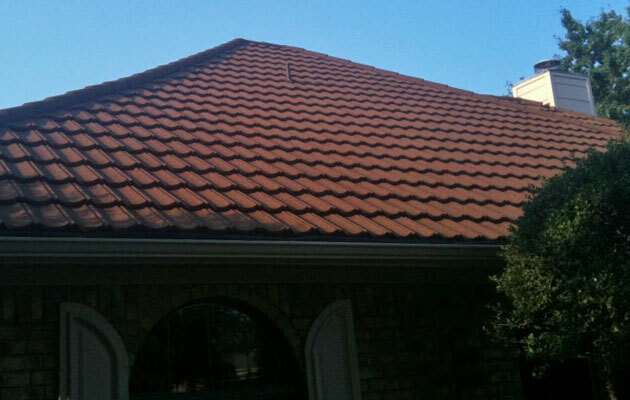 Offering the beauty and style of Mediterranean Tile and the lightweight of stone coated steel, a Decra Tile roof will add a distinctive elegance to any home. There are a few colors that are only available with Decra Tile and these include: Garnet, Terracotta and Arctic Blue. 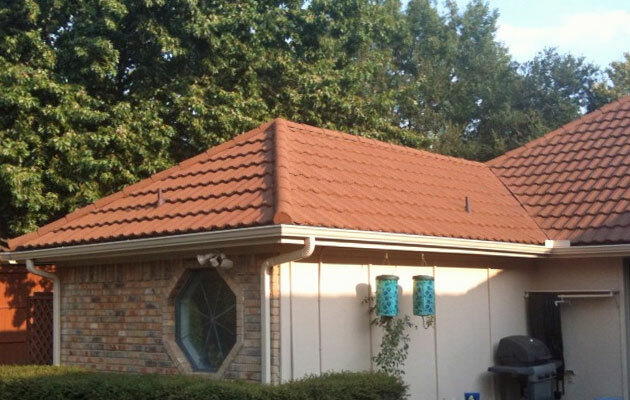 Take a look at the pictures below to see a newly-installed Decra Tile roof. 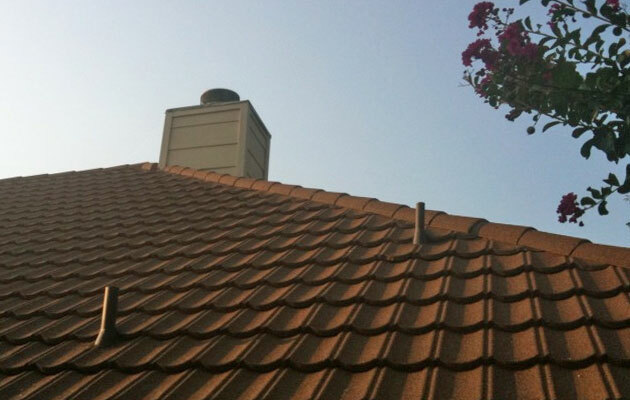 Newly installed Decra Tile on a Hip Roof with pipe jacks. Wide angle shot of Decra Tile Shingles on an open field. 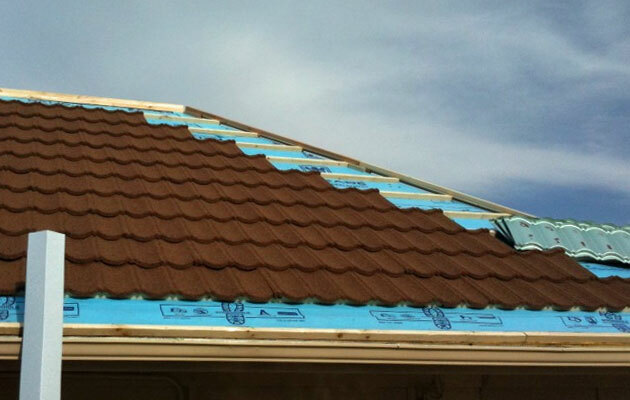 Upgraded synthetic underlayment provides superior deck protection on a Decra Tile roof. Skylight flashing on a Decra Tile roof install. If you are looking for the upscale design of a dimensional shingle, Decra Shingle is the choice for you. For the first time, you can have the beauty of this distinctive style, reinforced by the strength and longevity of steel. Colors available include: Canyon Brown, Midnight Eclipse, Fawn Grey, Woodland Green and Vintage Slate. 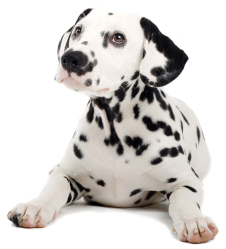 Ask your representative to bring samples when you request your quote today. Decra Shingle Plus has the rich bold appearance of a heavy weight Architectural Shingle at a fraction of the weight. With its deep distinctive shadow lines and the dimension of wood or slate, Decra Shingle Plus will complement any style. Colors include: Canyon Brown, Fawn Grey, Midnight Eclipse, Vintage Slate and Woodland Green. 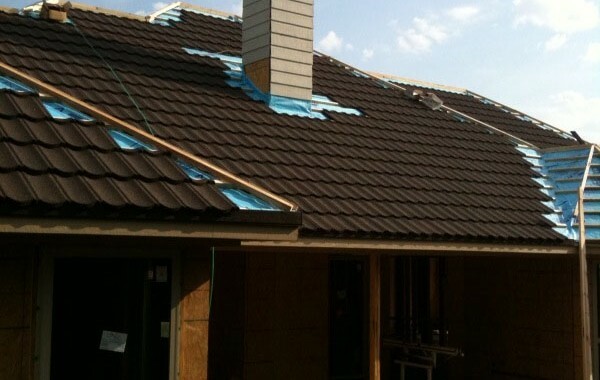 Decra Roofing Systems are a favorite replacement choice for upscale re-roofing projects. 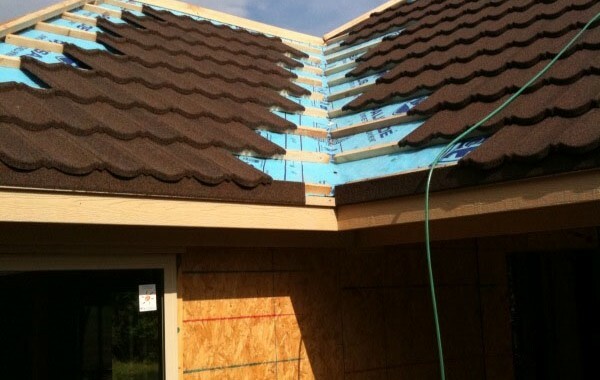 The product is extremely lightweight and can be expertly installed over failing fiber cement shingles (Hardishake, Maxishake, Cemwood, FireFree, etc.) as well as old wood roofs. A sheet of raw steel. The highest quality stone coating. Together they form a product of strength and performance that withstands hail, fire, earthquakes, even hurricane force winds. 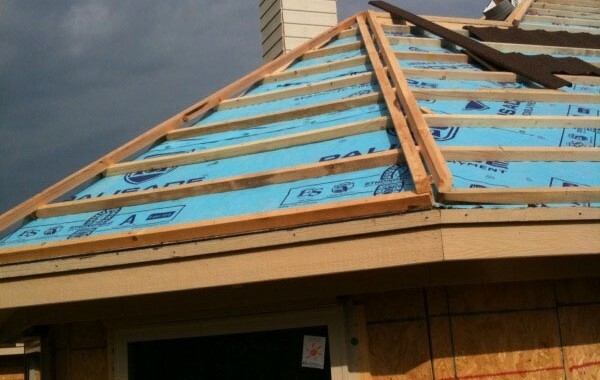 If you’re interesting in a Decra Roofing System for your home or business – and you’re located anywhere within 50 miles of the Dallas / Fort Worth Metroplex, call the office at (817) 213-6332 or toll-free (800) 417-7487. We will bring color samples to you.